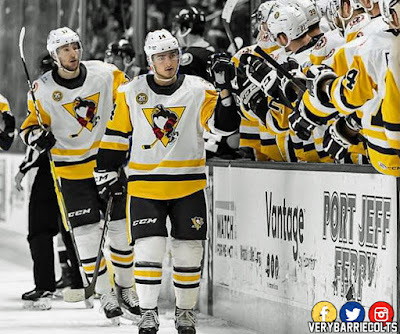 Joseph Blandisi Scores 1st Goal With WBS Penguins. (VIDEO) #AHL - Very Barrie Colts | A website covering the Barrie Colts of the OHL. Today, Barrie Colts alumni forward Joseph Blandisi played his first game with the Wilkes-Barrie Barre/Scranton Penguins of the American Hockey League. Blandisi was acquired by the Pittsburgh Penguins less than a week ago in a trade with the Anaheim Ducks. "Blender" would play a game in the NHL with Pittsburgh before being sent down to WBS a few days ago to get some ice time as Pittsburgh is now in their bye week. Blanisi was placed on the teams top-line with Teddy Blueger and Anthony Angello in his debut. The Penguins went on to with the game 5-2 over the Bridgeport Sound Tigers. The goal was "Blenders" ninth of the season having scored eight with the San Diego Gulls prior to the trade. Blandisi also has 15 assists on the season. Congratulations on your first with WBS and we look forward to many more with the Penguins organization!